Although my sweet tooth is insatiable, everything has a time and a place - even sugar. Now, don't get me wrong, I'll happily eat dessert every day of the week (and come back for seconds), just not early in the day. As kids, we got to eat pretty much anything we wanted (one bonus of having an incredibly picky sibling). Sure, my Dad kept us fed on a healthy Mediterranean diet at night, but in the morning anything was fair game; the sugariest of cereals, pop tarts, toaster strudel with extra frosting...there were no rules. But now that I'm older, the magic has worn off. Those kinds of cloying breakfast foods are completely unappealing. Even Honey Nut Cheerios are too sweet for me - so I stick to savory instead. I first made this tart back in culinary school, and it was love at first bite. If the French know one thing, it's how to make a bangin' savory bake. My version incorporates more spices and herbs, adding depth to an already awesome flavour profile. This bake isn't quick, nor is it particularly healthy (it takes a lot of fat to caramelize onions) but it is incredibly delicious. It stores well in the fridge, so you can easily make it in advance and reheat it right before serving. This tart is perfect for special occasions where you want to impress (Christmas brunch, anyone?) and cooking it early means you can avoid some stress. * If you don't have cake flour you can substitute all purpose flour in it's place. However, cake flour (which contains less protein and therefore creates less gluten) will make for a more delicate, melt-in-your-mouth crust. ** When you cut the onions you're definitely going to think you have too much. Trust me, you don't. The onions will cook down a lot. I thought I was fine with only three (and I didn't want to go back to the store) but I wish I had more once I started assembling everything. *** Yeah, that's an insane amount of butter, but if you take your time with the caramelization you probably won't need it all. But better safe than sorry. **** I used campari tomatoes, though any ripe tomato works well as long as it's sliced thick enough. However, I live in the real world and understand that good tomatoes in the late fall/early winter can be hard (and expensive) to find. If you don't want to bother, you can leave them out, or substitute apples instead. You want something like a Honeycrisp or Pink Lady - not too sweet, not too tart, which won't fall apart during baking. Just be careful; if you're too heavy handed with the apples, the excess moisture will lead to a soggy bottomed tart. 1. 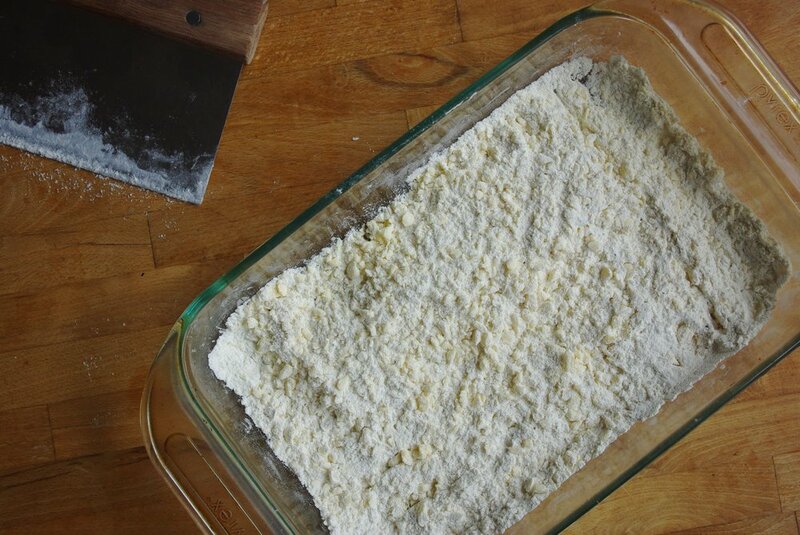 STIR together the flour, sugar, salt, and pepper for your tart dough. I use a casserole/baking pan because it contains the dry ingredients well as you cut in your butter. 2. SLICE your cold butter into large cubes and add to the dry ingredients. 3. CUT the butter into your dry ingredients, using a bench scraper, knife, or pastry blender. Work quickly to avoid the butter becoming too warm and melting into the flour - if you need to, stick the pan in the fridge or freezer to cool back down. The butter needs to be cut into lentil sized pieces when you're done, no larger; big flecks of butter will create holes in your tart shell once baked, so keep them small, but not so small they disappear. 4. CHILL the flour/butter pan for about 20 minutes in the fridge. You can skip this step if your butter is still very cold after cutting it in, but a brief chill will prevent it melting during these next steps. 5. ADD your ice water in, approximately 1-2 tsp. at a time. As you sprinkle the water over the dough, use squeezing motions to bring together the wet and dry ingredients. Push aside the hydrated chunks of dough as you work and continue sprinkling water on the dry ingredients, squeezing together. Don't panic if the mixture seems too dry, just keep squeezing the dry bits into your wetter chunks - you want a soft, shaggy dough. Chances are very, very slim you'll need additional water. 6. SMASH together the final dough. Take a small handful of the mixture (it's okay to have some wetter bits with some unincorporated flour) and use the heel of your hand to smear the mixture, moving in one fluid motion. Set aside (don't keep smearing the same bit and don't knead it!) Repeat with the rest of the mixture, working bit by bit to smash the last dry ingredients into the hydrated mixture. 7. GATHER the smeared dough bits into one ball - don't worry if it's still a bit craggy. As the dough chills it continues to hydrate, which is why home made crusts are always on the drier side when mixing. 9. QUARTER your onions and cut into thick slices. Thicker slices will help guard against burning and browning too quickly. 10. MELT 2 tablespoons of butter over low heat in a heavy bottomed pan. 11. ADD your sliced onions, thyme, and rosemary sprigs to the pan. Stir gently to coat. 12. COOK the onions over low heat, stirring frequently but not continuously. Be patient! Doing this properly will take a while, and don't try to speed it up by turning up the heat - this will brown your onions, but it won't caramelize them. If the onions start to colour too quickly, or if they look dry, add another tablespoon of butter. You can also add a sprinkle of salt to help draw out the moisture in the onions as they cook. 14. COOL the onions completely. Remove the thyme and rosemary sprigs and discard. 15. TOAST your walnuts very lightly in a pan, or in a 300 degree (f) oven for 3-5 minutes. Like the onions, these will continue to cook slightly as the tart bakes, so don't toast them fully. You just want a tinge of golden colour and that nice nutty smell. 16. CHOP the walnuts into pieces no smaller than a pea (no need to be extremely uniform here, you can have some varying sizes and bigger chunks) and set aside to cool. 17. ROLL your tart dough out on a lightly floured surface, working until you have a circle big enough to cover your 9 inch tart/pie pan. I like to put parchment paper down and roll my dough on top of it; in the event that it sticks a little, you won't have to scrape if off the table. 18. LINE your tart/pie pan, taking care to fold the dough into the corners of the pan (so you get that nice, clean line around the base - no sloping sides!) and pressing it firmly into the walls/grooves on the side. 19. COVER gently with plastic wrap and return to the fridge for at least 20-30 minutes. DO NOT TRIM THE DOUGH YET. 20. SLICE your tomatoes (or apples) into 1/4 - 1/3 inch pieces. Place the sliced tomatoes on a cutting board or plate lined with 2-3 layers of paper towels. 21. BLOT the tops of the tomato slices with paper towels to absorb the excess moisture. 22. PREHEAT the oven to 350 degrees (f). 23. REMOVE your chilled, lined tart pan and trim the edges using a sharp knife. If you're using a pie pan you can crimp the edges into a decorative boarder, or just cut it straight like you would with a tart. 24. ADD the cooled onions to the tart shell. Smooth them into an even layer, but don't try to compress them too much - pushing them into the dough itself can ruin the bottom. 25. SPRINKLE half of your chopped nuts and half of your crumbled cheese over the onions. 26. LAYER the tomato or apple slices on top of the cheese and nuts, making sure there's space around each slice. 27. SPRINKLE the rest of the nuts and cheese on top. 28. 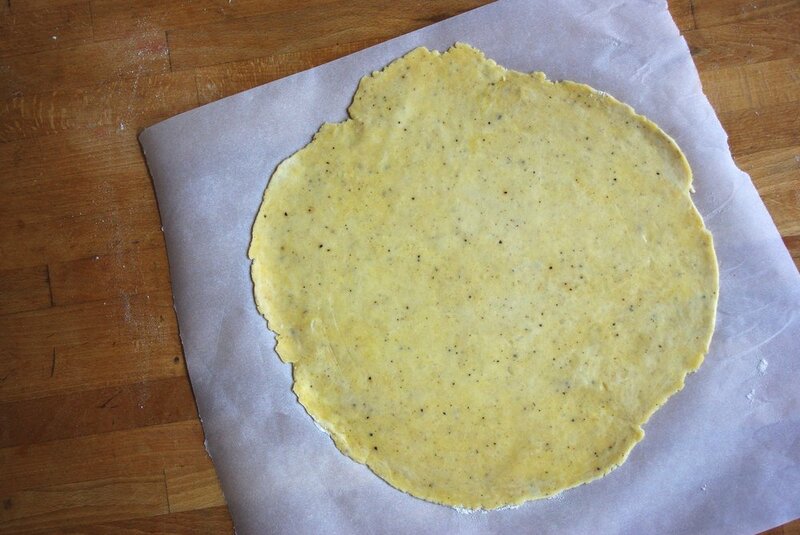 FINISH the tart with a dash of salt and a few cracks of fresh pepper. 29. BAKE the tart for 10 minutes, turn, then bake for 10 minutes more. Depending on your oven strength, you may need more time (my sad, weak oven took about 40 minutes to bake this tart). Check the tart frequently, keeping an eye on the crust - the tart is done baking when the crust is golden brown, although you can take it slightly darker if you like (or if you're worried about the bottom baking through). 30. REMOVE the tart from the oven, and cool on a rack. 31. REMOVE the tart pan (if using). Skip this step if you've baked in a pie pan. 32. SLICE the tart and serve warm. 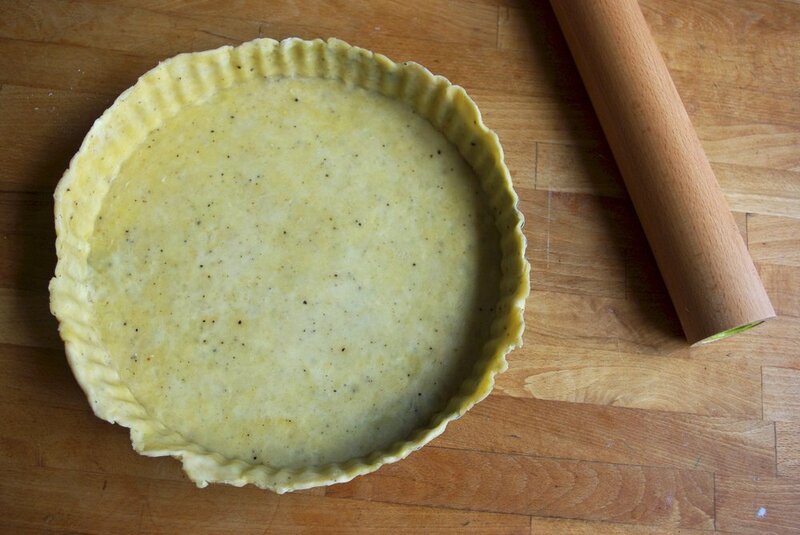 Or, you can refrigerate the tart (once it's cooled completely) for up to 4 days. To reheat the tart, place in a conventional or toaster oven set at 300 degrees (f) until warmed through.